Girls love bright colors and personalizing their belongings with their own unique style. A must-have kit for any girl, the Bikes On Hikes 69-Piece Children's Bike Set includes everything she needs to add flair to her bike and stay safe on the road at the same time. Easily snap multi-colored, ball and star decorations onto tire spokes to add vibrant color to any bike – there are 30 of each shape. Additionally, you can light up your tires with the two, pink valve sealing caps. It easily screws onto the valve of your tire in seconds and flashes while riding at night. Now that you've decorated the tires, you can move up to the handlebars. Add some flair with pink streamers hanging on each side, along with a purple, flower-shaped mirror for rear viewing. For increased safety, you can install the purple horn and pink bell to make some noise. In addition to furnishing a timeless, retro look, each one boasts a fun, loud tone to make your presence known. It's also important to stay visible in low light conditions when cycling. Attach the white headlight to the front and the white taillight to the back to stay safe in dark areas. These bright LED lights have three settings – steady, blinking and flashing – which can be changed by simply pressing a button to accommodate your preference. You can use the steady light while you’re pedaling away, and use the blinking or flashing light to alert others of your presence on the side of the road. Vibrant, safe and extremely stylish, this 69-piece set makes a great gift for any girl. It will light up her ride, keep her visible in low light conditions and turn heads to boot. 69-PIECE ACCESSORY SET. Everything you need to show off your own unique style is included in this bike accessory set. Personalize your bike with a horn, mirror, bell, two streamers, two flash valve sealing caps, two white lights, and 30 stars and 30 balls to put on the wheels. BRIGHTLY COLORED WHEEL ACCENTS. Add some personal flair to your bicycle with vibrant decorations for bike tires. Multi-colored, ball and star decorations easily snap onto wheel spokes, while two, pink flash valve sealing caps screw onto tire valves and flash when pedaling at night. ADD FLAIR AND SOUND. This set includes two streamers furnished in a bright pink color to add flair and pizzazz to any girl's handlebars. Additionally, the pink "I love my bike" bell and purple horn with white hearts offer a timeless, retro look combined with a loud dual tone to announce the rider's presence in style. PROTECTIVE ELEMENTS. You can light the way and stay visible to others with the bright headlight and taillight. Want to see what's behind you? Attach the flower-shaped, purple mirror for rear viewing and create increased visual appeal at the same time. GREAT GIFT IDEA. 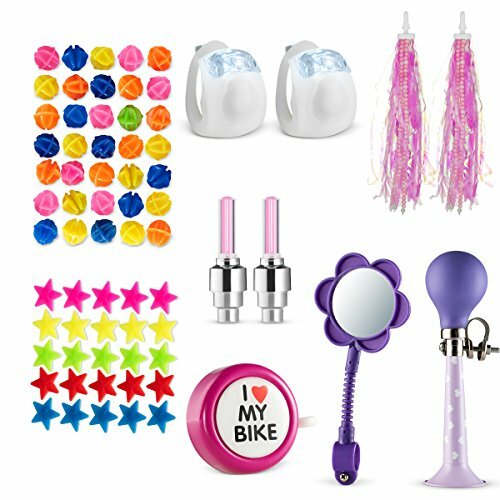 Perfect for girls of all ages, this 69-Piece Bike Set will make a great gift for birthdays, holidays and other special occasions. Furnished in pink and purple, as well as multi-colored shades, this set is a great way for her to add color to her bike and ride in style. If you have any questions about this product by Bikes On Hikes, contact us by completing and submitting the form below. If you are looking for a specif part number, please include it with your message.